- When calling global constructors. Calling the _init function makes QEMU go back to the GRUB selection screen. I execute BOCHS and F5 to execute until the magic breakpoint. From this point, I use CTRL + F7 (Physical dump) to show 0xB8000 (VGA map) and F2 for the Stack content, while I F11 for step-by-step debugging. On the other side, I compile my kernel using -g parameter, to include debug information and I have the output of an objdump "-D -M Intel --source" on one side of the screen. This way I have full information to follow what exactly the kernel is doing and it helps me figure out quickly what is wrong. This sounds like a triple-fault. That means, you have a fault, but the exception handler cannot be accessed either, therefore a new fault raised, which in turn cannot be handled either. The default behaviour of x86 is to reset the CPU when 3 faults accour in a row (hence you end up in GRUB again). Try to run qemu with "-d int" to see what exception or fault occurs first. That's definitely not the video RAM buffer. 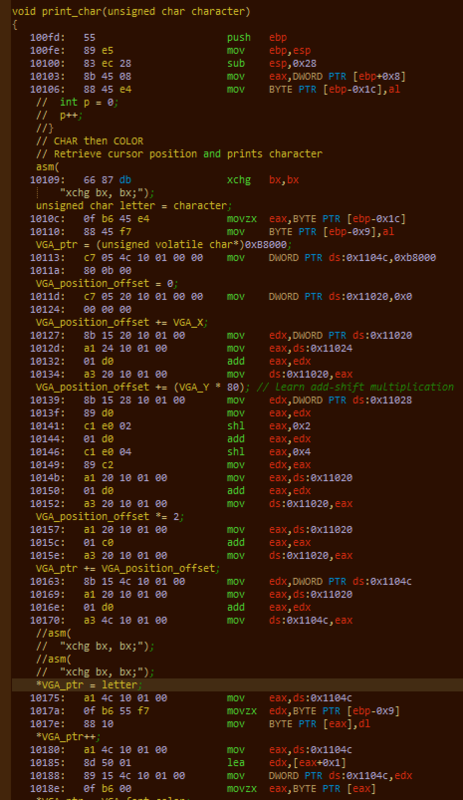 Reading 0xFF suggests you are reading from the wrong memory offset. You should read altering bytes, just like on mihe's screenshot, because text mode contains ASCII codes and attributes one after another. On the screenshot you can see 0x20 and 0x07 which means space character with white on black background. 0xFF as an attribute would mean blinking bright white on white, very very unlikely. It seems you got an exception 0xd. Open up the intel manual and check which exception belongs to number 13. The next thing is, figure out which code was loaded at IP (0x100110), and find that in your source. There're several ways, one would be to disassemble instrutions (a few before and after the faulting address) and look for those mnemonics in your source. The point is, figure out which source line corresponds to address 0x100110. Once you know the instruction that's causing the fault, look it up in the intel manual, and read on which conditions it throws a general protection fault. That will give you a clue what your code is missing. Now that you know where the misbehaving instruction is located in you source, and why it's misbehaving, you can start to fix it. If your code runs perfectly in bochs, then you can also compare the environment, look for register values that are different. 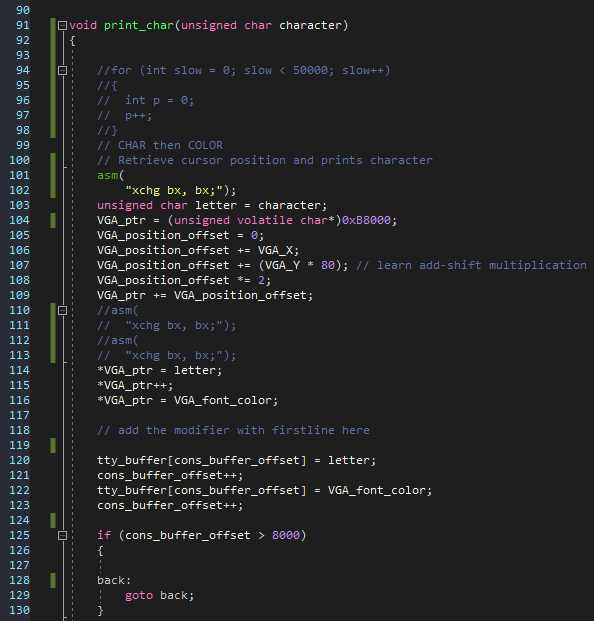 This might give you the idea what you haven't set up properly (and initialized differently by bochs and qemu). Remove the multiboot2 address_tag and see if your call to _init works. As for displaying characters.If you have requested a framebuffer GRUB is probably going to toss you into a graphics mode. You won't be able to write to 0xb8000 text video memory and have that updated on the display. In graphics mode you will have to render the characters yourself. Okay, you just solved both my problems at once. Thanks everyone for helping me! Just one last question: Why does removing the address_tag make the call to _init work ?